Tools - A list of the tools you will need and may want to use. The Guide - The step-by-step process of converting a DVD to DivX/XviD. Notes - A combination of "Optional, but sometimes useful, tweaks" and "Overcoming common issues". Feedback - An invitation to leave feedback. Lots of devices play DivX/XviD these days, from PDAs to games consoles and an ever increasing number of people are choosing to stream their own media. However, it was only a few years ago that everyone started to replace their VCRs with standalone DVD recorders and were recording things to DVD+/-R.
As people tend to record multiple features (or "episodes") onto one DVD+/-R, it can be a bit of a bore to convert each of those features one by one. This guide will take you through the process of converting a whole DVD+/-R at a time, allowing you to convert your DVD+/-R collection to DivX/XviD with relative ease. This tool is required by DDTool. 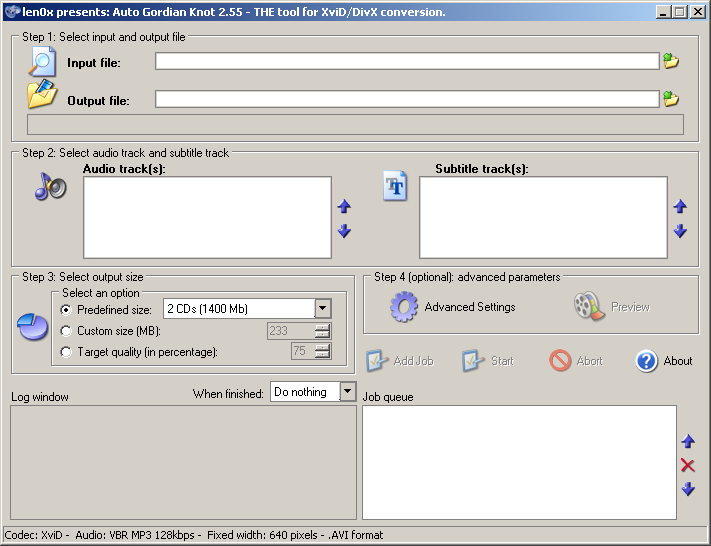 Auto Gordian Knot (or AutoGK as it's also known) is the software we'll use for conversion to DivX/XviD. You can use VLC to play the VOB file to make sure you have extracted the right parts of the DVD. VLC will play many file types and is highly respected. In this guide we will focus on converting the features to XviD (instead of DivX). However, it is easy to convert the files to DivX using this guide, if you prefer, by changing a simple setting within the "Advanced Options" of the software we are going to use (AutoGK). If you haven't already done so, install all the essential tools now! You only need to configure the tools the first time you use them (or if you've messed with the settings since you last followed this guide). So, if you already have the tools configured skip to STEP 1. 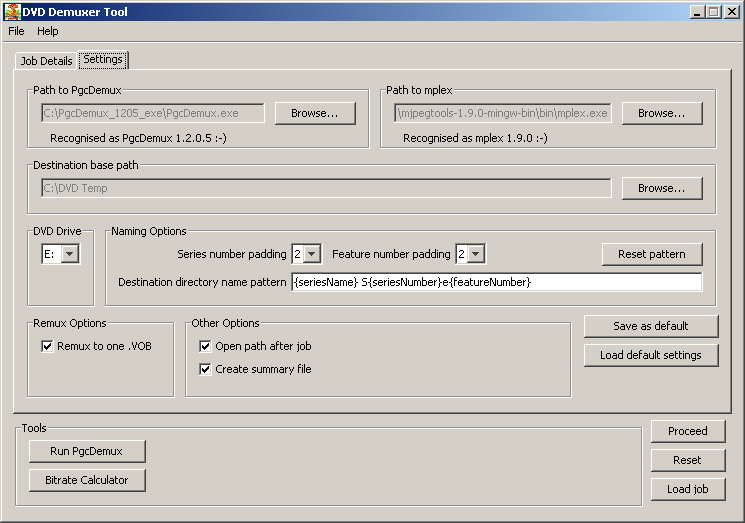 Path to PgcDemux - Click "Browse" and locate PgcDemux.exe. Path to mplex - Click "Browse" and locate mplex.exe (it's in the 'bin' folder of MJPEG Tools). Destination base path - Click "Browse" and locate the base directory to which you'd like all your files to be saved. 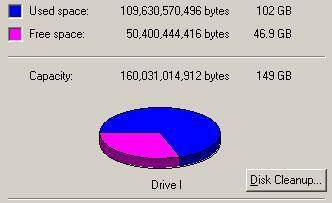 DVD Drive - The letter of your DVD-ROM drive. Series number padding - The amount of padding you'd like applied to the series number. If you choose '1', the series number will always be a minimum of 1 digit (e.g. 8, 9, 10, etc.). If you choose '2', the series number will always be a minimum of 2 digits (e.g. 08, 09, 10, etc.). If you choose '3', the series number will always be a minimum of 3 digits (e.g. 008, 009, 010, etc.). Feature number padding - The same as above, but for the feature number. Destination directory name pattern - The default pattern should suffice for most, but you are free to adjust it. Remux to one .VOB - Tick this if you'd like each feature to be one .VOB (and not split into 1GB .VOBs). You should enable this feature for this guide, as this guide assumes it has been enabled. Open path after job - Tick this if you'd like the job path to be opened once the job completes. Create summary file - Tick this if you'd like DDTool to create a summary (text) in the rip path. Once you've configured everything on the settings tab, click 'Save as default'. 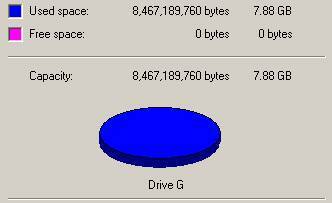 Before you start ripping a DVD, you should ensure you have enough free space on the hard drive to which you are going to rip the DVD. I recommend you have at least three times as much space free than the total size of the DVD. So if you have a 4.35GB DVD, you should have at least 13GB free. If you have an 8GB DVD you should have at least 24GB free. If you have more than one DVD to convert to DivX/XviD (as AutoGK can convert more than one DVD using it's "Job queue", which you'll see later) then you will need to check you have enough free space for more than one DVD. Just remember you need at least three times as much space free than the total size of each DVD. If the DVD you wish to convert isn't already in the DVD drive insert it into the DVD drive now. Start DDTool (if it isn't already running) and click the "Run PgcDemux" button. PgcDemux should start. Once PgcDemux starts, you can use it to check the structure of the DVD in your DVD drive. You must take note of the DVD structure before you can use DDTool. Now, by clicking the "Browse" button, under 'Input IFO' and going through each of the .IFO files that make up the DVD, you should be able to locate the features you want by the listed play lengths. Note: If your DVD has 'multiple PGCs per one VTS' like this, you'll need to use PGC Mode (in the next step). Note: If your DVD has 'One PGC per multiple VTSs' like this, you'll need to use VTS Mode (in the next step). Before we continue, you may find it useful to keep PgcDemux open (after following the previous step) so that you can refer to the information it provides about the structure of the DVD, whilst they enter the details into DDTool (in this step). It's probably a good idea to close PgcDemux before the actual ripping takes place though! Start DDTool (if it isn't already running) and ensure you're on the "Job Details" tab. If PgcDemux shows Multiple PGCs per one VTS select PGC mode. If PgcDemux shows One PGC per multiple VTSs select VTS mode. If PgcDemux shows any other structure, select Manual mode. Enter the name of the series (e.g. "Christmas Home Videos"). Depending on the mode selected, you will be required to complete a different set of options. Series number - select the series number (e.g. "2"). DVD number - if from a set, select the relevant DVD number, otherwise leave it as "1". First feature number - select the number of the first feature on the DVD. Number of features - select the total number of features contained of the DVD. VTS Number - Select the VTS number that contains all the features. First PGC - Select the PGC number that contains the first feature. Once you've entered these details, click "Proceed" and skip to STEP 4. First VTS - Select the VTS number that contains the first feature. PGC Number - Select the PGC number that contains each feature. Once you've completed the "Basic Details" section, click "Proceed". VTS Number - Select the VTS number that contains the given feature. PGC Number - Select the PGC number that contains the given feature. Once you've entered the details for a feature, click "Next" and enter the details for the next feature. Once you've entered details for all features, click "Finish". Once you've completed the previous step, you should be presented with the "Job progress" window. Take a few moments to revise the details on this screen to ensure they are correct. If the details are not correct, click "Close" and re-enter the details. If the details are correct, click "Go!" and DDTool will create the relevant directories within the destination directory and then start to rip the DVD to those directories. It may take a while for DDTool to complete and in that time DVD Decrypter will pop up as it rips each feature. Once the DVD has been ripped, DDTool will generate a .ddmfr2 file within the directory that holds the ripped files. The .ddmfr2 file can be used if you ever want to re-run the same job (using the "Load job" button in DDTool). You can now close DDTool and continue to the next step. Next, under "Select output size" click on the "Custom size (MB)" option. Note: selecting this option will cause AutoGK to encode the video using a 2-pass method. This means it will read the feature from the .VOB file twice, to improve its final quality. If the features were around 20 minutes, I would try to get 3 features on to one 700MB CD-R. Therefore, I would set this value to about 230 or even 233 as 233 multiplied by 3 equals 699 (just enough to fit onto a 700MB CD-R). If the features were around 30 minutes, I would try to get 2 features on one 700MB CD-R. Therefore, I would set this value to about 350 or maybe 349 as 349 multiplied by 2 equals 698 (just enough to fit onto a 700MB CD-R). After a while you will get an idea of the sort of number you want to enter here. If you are uncertain, you could always just convert one feature for now and see how it turns out before you convert the rest. Note: you only have to set the "Custom size (MB)" for the first feature. The same values will be used for the other files you add. Next click the "Advanced Settings" button. Leave the Subtitle options both disabled. Once you have done this, you can click "OK". Note: Every time you use AutoGK from now on it should retain the Advanced Options. You will have select the "Custom size (MB)" option and set the value (on the main AutoGK screen) every time you start AutoGK, though. Finally click "Add Job" and this job will be added to the "Job queue". Next, you can either add the remaining features to the Job queue, or you can just click "Start" to convert the first file and see how it comes out. Click the "Input file" browse icon, locate the .VOB for the next feature and click "Open". Repeat this for the remaining features you wish to convert and then click the "Start" button. AutoGK will run a series of applications (which will appear on your task bar) to convert each feature to a XviD/DivX .AVI file. It can take anywhere between 20 minutes and 2 hours to convert each feature (depending on the specifications of your computer). The output will be located in the "Output file" folders you specified earlier. Now you can just sit back/have a coffee/go to work/go to sleep (delete as appropriate) until AutoGK has completed the job queue. Note: whilst AutoGK is converting a series of features to DivX/XviD, you can rip the next DVD you want to convert (using DDTool) and load the ripped files into the AutoGK Job Queue. Once it has completed the first series of features, it will continue to convert any additional features you have added to the queue. If this is one of the first features you have converted to DivX/XviD by following this guide, you should probably check the output to ensure the quality meets your satisfaction. If it doesn't you should adjust the quality setting in AutoGK ("Custom size (MB)") and try again. This means that PgcDemux didn't rip the feature properly. If you have another go, it should be ok. If you get the same error you could either try another DVD drive. It seems you either need to replace the VirtualDubMod.exe with a fixed one, or possibly replace Symantec AntiVirus with another anti-virus package. Firstly, you should check the .VOBs contained audio by playing them in a .VOB-compatible media player, such as VLC media player. If you cannot hear any audio when playing the .VOBs, you may need to install AC3Filter. If that doesn't work, try re-ripping the .VOBs after AC3Filter has been installed. If the .VOBs contained audio and your certain you chose a valid audio track in AutoGK, you should note that although this guide suggest you use VBR audio (as it's generally more efficient), some players cannot process VBR audio very well (if at all). 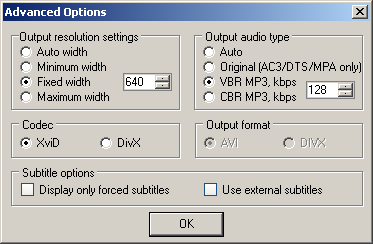 So, if you experience any problems with the audio of your .AVI files, try setting the "Output audio type" to: CBR MP3, kbps  (under "Advanced Options" in AutoGK). Thanks to MaxBlack for the tip-off. Feedback is always welcome! Please post your comments, suggestions or questions to the forum.